Thirty minutes from the nearest town in the Sierra foothills that leads to the desert there lurks a threat to the wallet of every American consumer. It hides along and travels the rails. This story might sound like something from an old Spaghetti Western or a move from a bandit’s playbook in the mid-19th century, but the NBC Bay Area Investigative Unit has learned that theft from freight trains traveling the rails is all too real in modern-day America. “Happens every day,” said Ron Greene, vice president of Strategic Global operations for private cargo security company FreightWatch International, based in Austin, Tex. Train robbery is a crime that causes billions of dollars of loss to the economy every year according to industry insiders such as Greene and federal and state law enforcement officials. These same people say that train robbery is a crime that causes billions of dollars of loss to the economy every year, and one that costs every American in higher prices on big ticket items. That means if you buy a high-definition television worth $4,000, you are actually paying around $320 more to account for the expected theft of some of those same items on the rails. Federal Immigration and Customs Enforcement (ICE) officials nabbed a gang of thieves after agents found them stealing $200,000 of high-definition, flat screen, 3-D televisions in the desert east of Los Angeles by the Arizona border in June 2010. 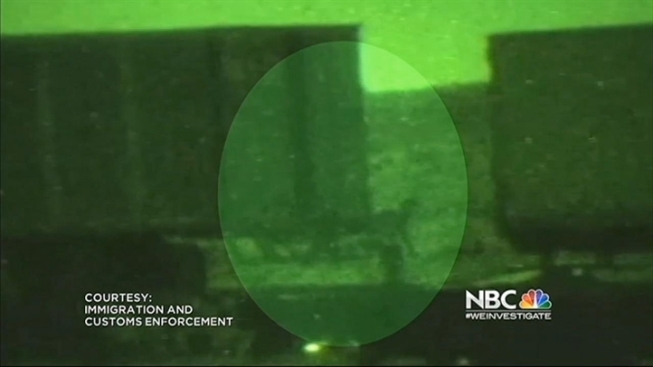 Undercover night-vision video shot by ICE agents shows four men removing the televisions from the back of a cargo container on a stopped train and then carrying the TVs on their backs through the wilderness. “You definitely have to be in the right place at the right time,” said Claude Arnold, Special Agent in Charge in the Department of Homeland Security’s Los Angeles office of Immigration and Customs Enforcement. Last year Arnold’s office helped convict the four men involved in the heist in federal court. But he admits that catching the train robbers in the act is like finding a needle in a haystack. There are more than 138,000 miles of railroad track across the country including the more than 5,300 in California, according to the Association of American Railroads. The organization reports that California moved more than six million rail carloads in 2010. And since thieves most often operate under the cover of darkness, spotting them is virtually impossible. According to federal documents, ICE agents used a confidential informant to gather details about the impending heist, which the thieves had planned for weeks. According to the federal documents, the robbers hid in cargo containers starting in Barstow and rode the train east to Needles where they unloaded the televisions. Authorities say some of the hottest spots for this crime in the nation are in sparsely populated parts of California, including areas between Tracy and Manteca, places outside of Stockton, areas near Fresno, locations in the desert east of Los Angeles and sites dotting the Tehachapi pass east of Bakersfield. Officials say thieves also work the tracks though the desert in Arizona and New Mexico as well as in the train yards around Chicago, Atlanta and New Jersey. A local ranch supervisor outside of Bakersfield told NBC Bay Area’s Investigative Unit that the practice of train jumping is so common near his ranchland that he pointed to evidence of food and drink wrappers and toilet paper showing someone had recently hung out next to the train tracks in a desolate area in the Tehachapi pass. Industry insiders tell NBC Bay Area that trains are at their most vulnerable in places when they travel up steep grades at low speeds, slow down at crossings or stop at train stations. “The train is longer than the station is, the criminals get on board the trains and they will climb through the containers and through trailers finding what they want,” said Sgt. Ward Radelich of the California Highway Patrol’s Cargo Theft Interdiction Program out of Oakland. Often times rail heists are highly organized, law enforcement agencies tell NBC Bay Area’s Investigative Unit. They have recovered stolen products along with bolt cutters and saws used to break the locks and cut holes in cargo containers to offload stolen loot. Industry insiders say they have even found backpacks full of several days’ worth of food and water left behind in the train cars. Despite what law enforcement characterizes as a prevalent crime, the full extent of the problem is not known because companies do not make their crime statistics public. A half-dozen major rail companies all declined to speak about this issue for the record. But several mid-level officials with three different train companies anonymously told the Investigative Unit that this is a serious problem and one that is growing despite best efforts to stop it. And rail theft continues to rise in other parts of the world, industry insiders tell NBC Bay Area. According to a report published by FreightWatch earlier this year, thieves in Mexico are increasingly causing train derailments in order to steal loads in areas where trains travel at high speeds. To accomplish this, the criminals remove or break railroad ties or place obstacles on the tracks. Arnold says that’s not too far off what happens in other parts of America.